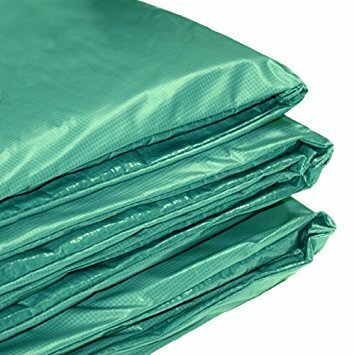 8' NEW DELUXE GREEN VINYL TRAMPOLINE PAD - $99 VALUE!!! Trampoline Depot's pads are one-piece design for maximum protection. It is heavy duty, shock absorbent, closed-cell foam which does not absorb water or lose shape, UV and water resistant. These pads are securely tied to the frame with straps under the pad. Note: Trampoline Depot is the only company carrying pads at 10.5-inch wide, while others are at 8-9-inch wide. With the extra 2 inches of coverage, it provides maximum safety protection, leaving no openings for trampolines with 8.5" springs. It is designed to prevent falling into the area between the bouncing surface and the trampoline frame. Federal consumer protection safety laws requires trampolines to have some type of pad on the trampoline frame. Our pads exceeds these regulations and provide a safer trampoline. All of our pads exceed ASTM Standards. It comes with a 4" side skirt to cover the frame and help keep the pad in place - it is made with 20oz PVC Vinyl (Top Layer), PE (Bottom Polyethylene), 1" thick foam padding near the frame and 1/2" thick padding at surface mat. These Ultra Premiere Trampoline Pads are compatible with JumpKing, Leisure Kingdom, Hedstrom, Wal-Mart, Costco, Sam's Club, Sports Chalet, Sports Authority, Sundance, NBF, AirMaster, Regal, Sky Bouncer, JumpSport, Bazoongi, Bollinger, Supertramp, and all other trampoline brands. Compatible with JumpKing, Leisure Kingdom, Hedstrom, Wal-Mart, Costco, Sam's Club, Sports Chalet, Sports Authority, Sundance, NBF, AirMaster, Regal, Sky Bouncer, JumpSport, Bazoongi, Bollinger, Supertramp, and all other trampoline brands.